"Normally, my mind is on school, friends, my phone, social media, stuff like that," Kutin told the New York Times. "But when I lift, I put it all to the side, and all I care about is that bar in front of me." "This is Naomi Kutin, the strongest teenager in the word in both the squat and the deadlift," announcer Geno Biancheri stated during a recent Sunday morning competition in the Garden State. 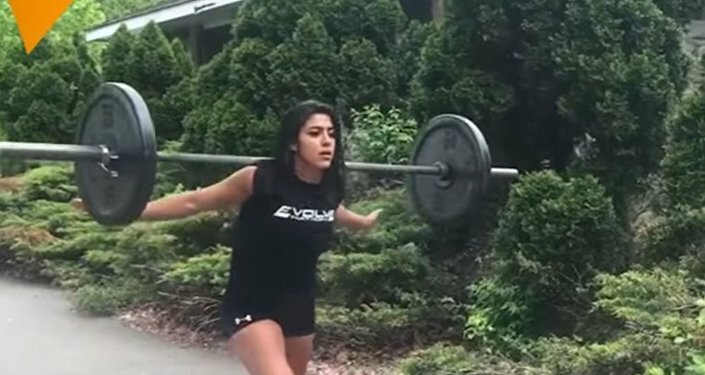 The teen squats a staggering 321 pounds and deadlifts 365 pounds. Kutin began lifting competitively at the age of eight, and started setting national and world records in adult powerlifting soon after. At just nine, she squatted 215 pounds, breaking the world record held by a 44-year-old German woman. "In school plays, I get stage fright, but I don't have stage fright in powerlifting, even if I'm in front of hundreds of people," the 16-year-old Kutin said, adding that she blasts heavy metal on her headphones before every competition. "I hate it — I only listen to it before I lift," she asserted. Kutin occasionally competes with her 14-year-old brother, Ari, and their father, Ed Kutin, who are both lifters. Neshama, also known as Mom, is the family's manager. Kutin learned the basics of lifting from her father in their basement, working out next to the washer and dryer. "We thought when she first started that it'd be a kid fad, that she'd quit within three months," Neshama Kutin explained. A documentary about Kutin's life called "Supergirl" will be broadcast on December 18 on PBS.